In this section you can see how to add or delete users. You can also set various roles for each user. Each role has different capabilities and is able to perform specific tasks although you can modify the tasks each role has as well. The Users screen lets you add, change or delete your site’s users. Also you can search for users, and you can make bulk changes and deletions to a selected group of users. Access the Users screen by clicking Users in the left side menu of the Dashboard. When creating a WordPress site, an Administrator account is automatically made. You can add more users at Users > Add New. 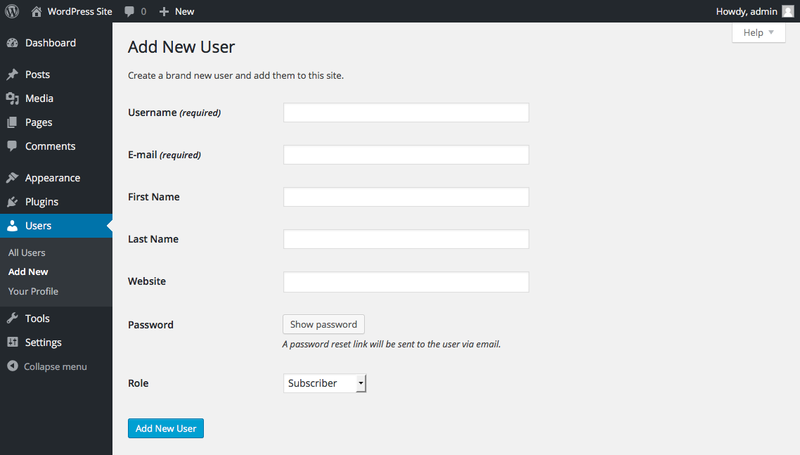 For each new user, a username and an email address must be entered. You can also enter the user’s first and last name as well as the URL to their website, if they have one. Finally, you must specify the role the new user has. When you’re done, click the Add New User button. An email will be sent to the address entered above, notifying the new user about the creation of their user account. WordPress has six predefined roles: Super Admin, Administrator, Editor, Author, Contributor and Subscriber. Each role can perform a specific set of tasks called capabilities. A default set of capabilities is preassigned to each role, but WordPress can be altered to assign or remove capabilities to each user role. The Super Admin role allows a user to perform all possible capabilities. Each of the other roles has a decreasing number of allowed capabilities. For instance, the Subscriber role has just the “read” capability. Super Admin – has access to the site network administration features and all other features. See the Create a Network article. A detailed list of all capabilities for each user role can be found at the WordPress Codex.